Sinhala literary works refer to the god as Dev-Senevi (Commander of the Divine Army, Kande Kumara (Prince of the Mountain), Sikhiyahan (peacock vehicled), Adayatidhara (Spear bearer), Mahasena ('Who has a Great Army'), Siddhasenapati (Indefatigable Commander), Baraneth (Multi-eyed), Huthasyon (Fiery Fighter) etc., but generally known as Kataragama Deviyo (the tutelary deity of Kataragama). 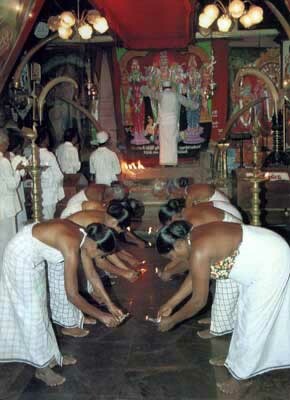 The anthropomorphic image of God Kataragama has six heads and twelve hands and hence known as Shanmukha ('six-headed') and Dvadasakara ('twelve-handed'). 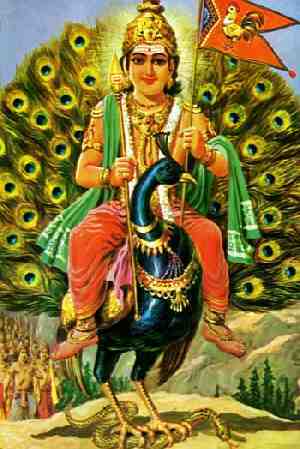 The god's vahana (vehicle) is the bird peacock called Paravani. The peacock is a gallinaceous bird (akin to the domestic fowl), native to Sri Lanka and India, having a fan-like tail brightly coloured with blue, green and purple 'eyes' on a lovely chestnut background.  It bears the scientific name Pavo cristatus, and is a sacred bird mostly found in the wild sanctuary of Yala. 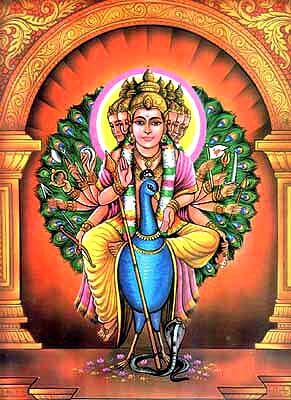 In keeping with the Pali epithet 'Mahasena devassa sammananiyam' (Praise be to god Mahasena), the Sinhalese call the God Kataragama as Mahasen Devi and believe him to be a warrior god. The saying 'Vikumen sadisi Mahasen' (the valorous Mahasena) confirms the belief. 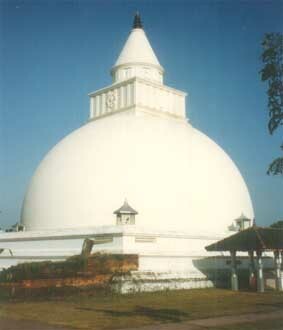 The Kirivehera chetiya, which stands close to the Kataragama Mahadevale, was built by King Mahasena who ruled over Mahagama (now Tissa) in Rohana. History says that when the Buddha made his last visit to the island, in the eighth year of His enlightenment (BC 580), he met the king at the spot where the chetiya now stands. Having listened to the Buddha's discourse, the king attained the higher faculty of sovan (the first stage of spiritual eminence as taught in Buddhism), and as a token of gratitude, the chetiya was built on that exact spot. After his death, the king is believed to have been elevated to the position of a deity wielding his mighty authority over Kataragama. God Kataragama is popular as the God of War and acclaimed as the warrior god Tarakajit because he had successfully slain the powerful asura (demon) Taraka at the Battle of Velupuram in South India and subsequently killed his two brothers, the demons Surapadma and Sinhamukha, who were a nuisance to the gods, in order to save them from harassment. 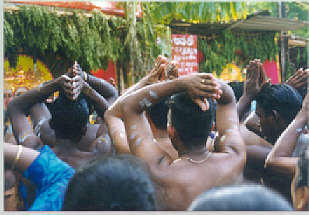 The annual Vel festival of the Hindus is reminiscent of the god's valour and heroism in killing the demons with his weapon Velayudha. Hence the name Kadiravel. The great Sanskrit epics Mahabharata (BC 300) and Ramayana (BC 500), written during the heroic age of India, have reference to the god Skanda and his exploits at war. 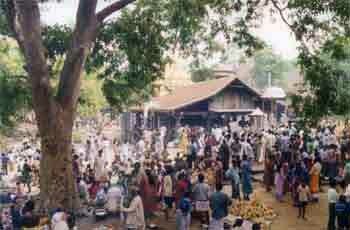 Hindus show their devotion to the god by clamouring 'Haro Hara!' as they approach the Mahadevale in profound faith. One day the demon, wishing to test the efficacy of the charm, tried to place the palm on the god's head and he, realizing the danger, began to flee pursued by the demon. 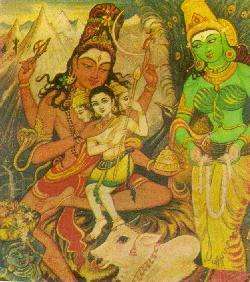 God Visnu, in order to save Iswara, appeared as a beautiful woman and stood on the way to attract the demon. The demon seeing her stopped running, approached her and began to talk to her. The woman's lascivious looks made him to abandon the chase and wished to possess her. God Iswara turned back to see the demon and as he was missing, thought that he would have given up the chase. Suddenly, he saw a woman standing beside him. He fell in love with her and expressed his desire to marry her. The woman, knowing that the god Iswara has a consort, requested him to go and get her consent to the marriage. When the god returned, he found that the woman had given birth to a son, and she told him to go again and get the consent of marry a carrying mother as she has conceived again. Puja is a sacred offering and includes only nuts and fruits, with the indispensable coconut in the tray. It is a 'must'. The fruit trays made available for sale in the market are of poor quality, and some nuts and fruits are either old or rotten or not ripe, and have only the commercial value. The best is to have a tray prepared under personal supervision using the best items.